Welcome to another edition of DT's cure for the Monday morning blues -- What Am I? In this better than living in Detroit game we find a random picture of a car and you get to guess what it is. Last week's puzzle was particularly difficult because it was the underside of a 1990 Dodge Power Ram Rod Hall Signature Edition Pickup, but it was solved by William Robinson a few hours later. This week I'm going to stick with the oddball stuff and see who figures this one out first. Just what am I anyway? Update with answer below. Update:A quick congrats to Andy Liss for recognizing this as a VW DoKa and Zach for finding the actual car here on eBay . 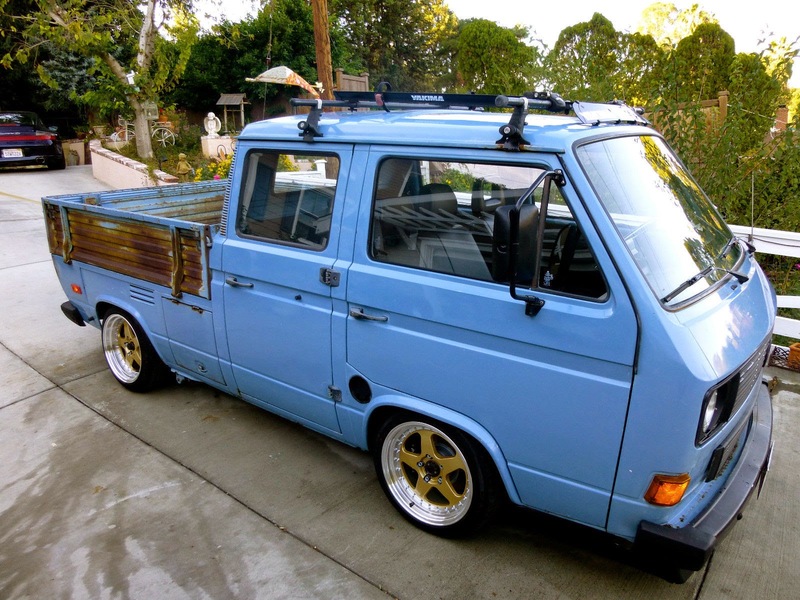 Do not attempt to adjust your monitor -- this is indeed a stanced '82 Volkswagen Bus DoKa (Doppelkabine) with a rusty bed. Current bid is $12,300 with 7 days to go, expect the final price to be much higher. Some sort of Land Rover? VW Doka Crew cab pickup? You are correct Andrew. I will update the post. Good job Zach, you found the actual vehicle...not that there are many Dokas for sale at any given time. I like the TDI swap! Maybe it's the English minor in my history but those typos/misspellings irk me like a burr in my sandal. I don't believe I'm alone in that these oversights cause me to (both consciously and subconsciously, I think) take the seller a smudge less seriously, given the lack of attention to detail. I don't know...this probably makes me elitist or sumthin. Smudge or smidge. Either one. The misspellings don't irk me as much as the center justified ALLCAPS BOLD FONT WITH NEEDLESS COLORING OF HEADINGS. And, why does the seller keeps calling everything original gangsta? "ALL GOOD OG GLASS"
Truthfully, I couldn't read the entire listing because of the ALLCAPS and didn't even notice it had a TDI engine in it until CFlo pointed it out here.